Alice Boyle is an Assistant Professor at Kansas State University. Her main research interests are in the movement ecology of birds. 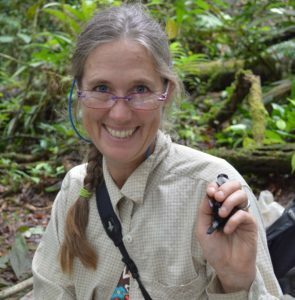 Her interest in biology and birds began when living in Costa Rica in the early 90s, and since 2000, she has conducted research in of the wettest forests of the Caribbean slope. Her tropical research addresses the causes of altitudinal migration, climatic drivers of population biology, and the behavioral ecology of White-ruffed Manakins. In addition to her tropical research, Alice also studies dispersal and population biology of declining grassland songbirds in Kansas. Animals living in tropical forests have evolved under stable temperature regimes that have, in part, permitted the evolution of spectacular examples of inter-specific interactions and specialized morphologies and behaviors. However, tropical environments are far from aseasonal. Precipitation is the major axis of seasonality at tropical latitudes, and variation in the amount and timing of rainfall shapes the structure, community composition, and ecosystem processes in tropical environments. However, we understand little of how variation in precipitation regime affects endothermic animals. I will provide evidence that both the long-term precipitation regime, and short-term rainstorms directly affect the fitness of tropical birds, and explore the mechanisms that underlie those responses. I will then discuss how species-level traits and environmental context should mediate the nature and strength of those responses. A better understanding of these responses is crucial for predicting and mitigating the consequences of ongoing and future environmental change.